New design by Annalee for 2017! 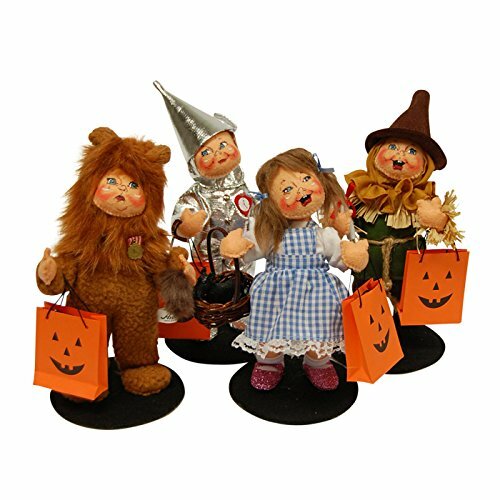 Set of 4 Wizard of Oz characters in the Trick or Treat Set of 4. Dorothy is adorable in her blue and white checked dress over her white blouse. She is wearing white socks and sparkling shoes. With blue ribbons in her ponytails and trick or treat bag in hand, she is ready to celebrate Halloween! Cowardly Lion is absolutely adorable. He is dressed in a plush looking lion costume and is wearing a little badge of courage. This little one is carrying a Trick or Treat bag and ready to make you smile! Scarecrow is adorable! He is dressed in green tunic and black pants with a gathered tan collar with a brown hat. Straw is showing at the neck area as well as the wrist and ankles. This little one is holding a Trick or Treat bag and ready to have some fun! Tin Man's outfit is adorable as well as the silver funnel on its head. The little one is ready to go out with a Trick or Treat bag in its hand. If you have any questions about this product by Annalee, contact us by completing and submitting the form below. If you are looking for a specif part number, please include it with your message.